3M™ Workspace Solutions (Click here for more information) Make office comfort and productivity a priority. Whether it means getting up and changing your position several times a day or rearranging your work area to alleviate stresses and strains, 3M™ provides products designed to help increase comfort and productivity. A desktop sit-stand workstation that fits you. 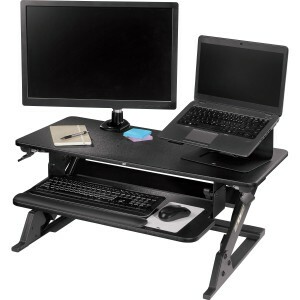 The 3M™ Precision Standing Desk provides maximum adjustability to achieve your most comfortable standing work position. The 3M™ Precision Standing Desk also includes a 3M™ Gel Wrist Rest for Keyboards and 3M™ Precise Mouse Pad with Battery Saving Design* for added comfort and productivity. Use a monitor arm to free up space on your desk and easily move your monitor into a comfortable height for viewing, or out of the way when not in use. Help protect your eyes, choose the right monitor position. Position your monitor 20 to 30 inches from your eyes, with the top of your monitor no higher than eye level. 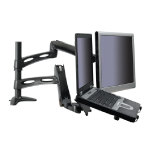 Choose a 3M™ Monitor Arm or Stand to help assure optimal positioning. 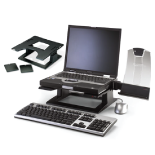 Support your arms, elbow and wrists with a wide variety of 3M™ Adjustable Keyboard Trays and Drawers, designed to provide a large, stable surface to hold both your keyboard and input device without extensive reaching. 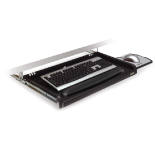 A 3M™ Adjustable Keyboard Tray will allow you to alternate among a variety of positions for optimal comfort. Placing a 3M™ Gel filled Wrist Rest at your workstation helps cushion and support your wrist. Wrist rests are designed to fit a variety of keyboards, including ergonomic keyboards. 3M™ Computer filters (Click here for more information) help reduce eyestrain caused by glare, and e-field radiation. 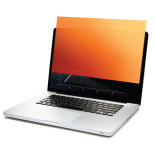 3M™ Privacy Filters make on-screen data visible only to persons directly in front of the monitor. With 3M™ Privacy Filters, you can work anywhere without worry. 3M™ Privacy Filters are the solution you need to assure you can get your work done wherever you are, knowing your information is secure. When you need to protect your information, 3M™ Privacy Screen Protectors keep data secure even in high-traffic, public places. With 3M™ Privacy Screen Protectors, displays appear black from side views while your view from directly in front of the screen is perfectly clear. 3M™ Privacy Screen Protectors for Smart Phones and for Tablets, 3M™ Privacy Filters are proudly made in the U.S.A.
Keep your computer monitor screen clean, use 3M™ Office cleaners and wipes to keep your monitor clean and free of fingerprints and smudges.